Off to the “drag” races…. Getting to meet fans at dog-friendly events means I also get to see every kind of dog collar, leash and harness. I always cringe when I see big dogs on those retractable leashes. 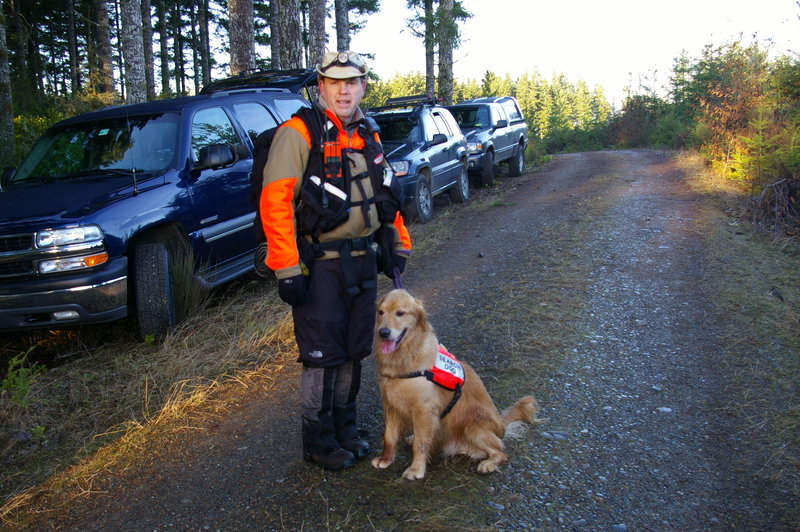 Bob & Magnum getting ready for a training search. There’s nothing wrong with the leashes themselves. The ones I’ve seen are well-manufactured, comfortable, retract as promised and don’t break. The issue isn’t the leash. It’s your dog’s ability to go from zero to sixty (Squirrel!) in the 20 feet of line they get from a retractable leash. A friend who is far and away the best dog handler I know suffered serious injuries when he was pulled down as his German Shepherd hit the end of its 20 foot long retractable leash. We’re talking broken ribs and shoulder surgery. Math majors will remember that if you double the speed, you quadruple the force. So if the dog has a bunch of extra distance to build up speed, you risk becoming the down payment on some orthopedist’s new BMW. And really, six feet of leash is plenty anyway.